Today on her Facebook feed, Caroline Leaf posted a quote which said, “Your behavior can and does dictate your genetic destiny”. Dr Caroline Leaf is a communication pathologist and a self-titled cognitive neuroscientist. In isolation, it sounds like she has found confirmation of her view that our thoughts and behaviour control the physical properties of our DNA (Leaf, 2013, p35). However, I wanted to look at the quote in a broader context, because in the broader context, the quote still doesn’t confirm Dr Leaf’s teaching. It’s not that Dr Moalem’s quote is wrong. In the book from which the quote is taken, Dr Moalem discusses the expression of genes (Moalem, 2014). There is no doubt that our behaviour affects the expression of genes. For example, when the body encounters a high level of dietary iron (ie: we eat a big juicy steak), a series of steps activates a gene to promote the production of ferritin, a protein that helps to carry iron in the blood stream (Strachan and Read, 2011, p375-6). These changes in genetic expression are mostly protective (for example, ferritin is used to keep toxic elemental iron from damaging our tissues). There are some behaviours that will override the body’s protection, for example, excessive exposure to UV radiation will eventually lead to skin cancer. But overall, the changes in genetic expression that our behaviour causes are protective, and do not adversely affect our health. 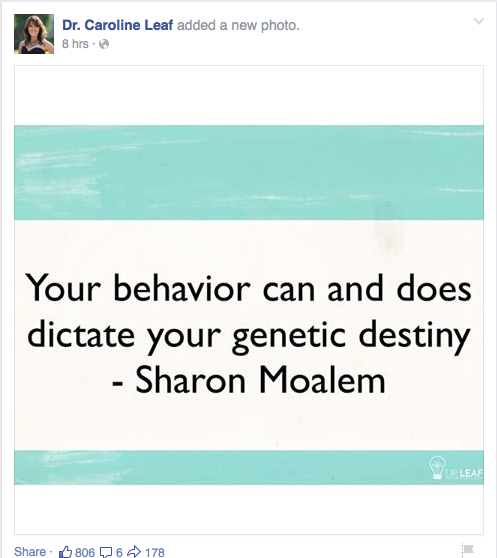 Unlike Dr Leaf, Dr Moalem does not promote the notion that our behaviour changes the genes themselves. Neither does he promote that our behaviour, in isolation, is the only modifier of our genetic expression. The quote that Dr Leaf used came from the second chapter of Dr Moalem’s book, “Inheritance: How Our Genes Change Our Lives, and Our Lives Change Our Genes”. Really, the title says it all. Our behaviour influences our genetic destiny, but our genes influence our behaviour just as much, if not more. For example, small variations in the genes that code for our smell sensors or the processing of smells can change our preferences for certain foods just as much as cultural exposure. Our appreciation for music is often changed subtly between individuals because of changes in the structure of our ears or the nerves that we use to process the sounds. The genetic structure of the melanin pigment in our skin changes our interaction with our environment because of the amount of exposure to the sun we can handle. Our genetic destiny is also largely influenced by our environment, most of which is also beyond our choice (Lobo and Shaw, 2008). So your behaviour can and does influence your genetic destiny, but your genetic destiny is more influenced by our genes themselves, and the environment that is beyond our control. Dr Leaf’s quote doesn’t look quite so supportive after all. Moalem, S., (2014) Inheritance: How our genes change our lives and our lives change our genes, Grand Central Publishing, New York. Strachan, T. and Read, A., (2011) Human Molecular Genetics. 4th ed. Garland Science, New York. This entry was posted in Biological, Caroline Leaf and tagged behavior, cancer, caroline leaf, criticism, DNA, dr caroline leaf, Dr Leaf, Dr Moalem, Facebook, ferritin, genetic, Leaf, neurobiology, pseudoscience, Sharon Moalem by cedwardpitt. Bookmark the permalink. Thank you for taking the time to examine the teachings and claims of Dr. Caroline Leaf. It seems she is becoming “all the rage” in Christian women’s circles these days and it is difficult to find someone willing to do this. I realize this is very time-consuming, and yet so many are so quick to jump on the bandwagon without even a cursory examination, partly because she is an “acclaimed” scientist and most of the rest of us are not. I became suspect within the first ten minutes of listening to one of her videos and I have no formal scientific training at all. However, I do love God’s Word and the truth and noticed right away she was misusing Scripture to back up her pet theories. Nor do we ever need science to validate God’s word, as she attempts to do; His Word is simply true because He spoke it. I have a genetic condition that has variable expression, but even I understand that you cannot change your genes from minute to minute and thought to thought. What a real mess of trouble we would be in if this were actually true! This line of thinking leads one to be afraid of their own thoughts and body, for who in this world can think positive thoughts at all times. The other problem I have with her teaching is that her teaching on disease does not line up with the information we have in the Bible about the role of the original Fall of man when he sinned, and the subsequent curse over all the earth as the cause of disease and death. The Bible clearly teaches what sin is, and it is not just negative thoughts. Sin has invaded the entire human being. The problem with her teaching is that she latches on to something that is true, but then she carries it to an extreme and impossible conclusion. She goes beyond what both science and the Bible teaches. My greatest concern is that her teaching will lead to the erroneous belief that we have so much power (according to her) over our lives that people will begin to believe the original lie that we “shall be as gods”. This falls right in line with the Manifest Sons of God and Latter Rain theology, not to mention the false gospels of Health and Wealth, Name It and Claim It, etc. I fell into the latter many, many years ago until I realized that these people were just lying to themselves and others. They weren’t really getting more blessed in the physical realm, they were just trying to convince themselves they were, and they would blacklist everyone who doubted or questioned what they were doing out of fear that it would undo all of their “progress”. In their books I would be a “toxic person” because I have toxic thoughts towards this teaching and not worthy of their time and attention. The great danger that this creates is that it causes them to blindly accept what they are being taught about it and shut off their critical-thinking skills. Scripture teaches we are to examine all things to see if they line up with the Word of God, not blindly accept someone’s teaching just because they call themselves an expert and a Christian. Finally, just so I don’t leave the wrong impression, I do also want to say that Dr. Leaf’s teachings are not completely without merit. We all know there are mental, emotional and spiritual benefits to thinking about good things (although the Bible says we are also to think about what is true and right, some of which Dr. Leaf’s teaching is not). I am not against Dr. Leaf as a person, and I suspect she has helped many people. But knowing and believing this never excuses one from critiquing a person’s work. If they teach something they must be able to defend it properly, whether it is scientific or spiritual in nature. And also, we must be very cautious when trying to combine the two. God’s Word never changes, but science and scientific theories constantly do. Better to rely solely on God’s Word to inform and meet our spiritual needs! Hi Bonnie. Thanks for your well-considered, insightful and supportive comment, and also your perspective on the hyper-faith gospels. I think your concern regarding the possible outcome of Dr Leaf’s teaching is valid, although its hard to be objective when such things are not studied empirically, but it’s certainly something to be mindful of. I agree with your observation of Dr Leaf’s loose interpretation of scripture, and with your observation that she tends to go beyond what science and the Bible reveals. And I also agree that Dr Leaf has helped some people, although I’m concerned that there is the potential for great harm too, to individual Christians and to the overall reputation of the Christian church. If I can encourage you to also voice your concerns to your friends and to the national oversight of the church denomination that you’re a part of, because I think it will only be through polite, persistent pressure at a grass-roots level that concerns about Dr Leaf’s ministry will be properly addressed. Once again, thanks for taking the time to share your opinion and support. It’s much appreciated. Thank you for your fine work on this. I have posted one of your blog posts on my Facebook page to try and create some awareness about these issues. I believe there is great potential harm in placing so much faith in positive thoughts. It is a form of delusional thinking and a denial of reality.